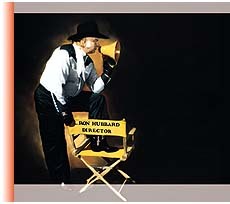 n 1947, as part of his larger research into the nature of human behavior, L. Ron Hubbard briefly studied the art of acting at what was then a prestigious Geller Workshop Theatre in Hollywood. Specifically, he was interested in the ways in which actors assume their roles and what he had termed the acquisition of a synthetic personality. Also by way of background, he studied European directing, and with the advent of Dianetics, was to work fairly closely with a number of luminaries within the Hollywood community, including both Gloria Swanson and Janet Leigh. In point of fact, he helped many a known and unknown industry figure with early Dianetics techniques. While in addition to what we have previously sketched regarding Rons scripting of films through the 1930s, the early 1950s found him advising studios on story ideas and audience tastes, while his own story Hoss Tamer appeared on NBCs Tales of Wells Fargo. The greater point: when he eventually set out, in early 1978, to form a cinemagraphic unit for the production of much needed Scientology training films, the foundation had already been established. The challenge, however, was not inconsiderable. In the first place, the subject of those films was Scientology, and thus involved often highly technical and philosophic discoveries relating to the handling of human mind and spirit. In the second place, he expressly called for a new type of filma dramatic training film with a story, to fully engage a viewer even when seen again and again. Finally, and because those involved had to understand the subject at hand, he required a crew of Scientologists... which, as it happened, ultimately required the training of that crew and thus the codification of all filmic fundamentals.